The College has recently submitted to Hammersmith & Fulham Council a series of further planning applications. One is a detailed application for the proposed Michael Uren bio-medical engineering centre, to replace the originally proposed hotel. A separate application is for a ‘minor material amendment’ to the 2012 planning permission granted in July 2012. This was the crucial permission to the overall masterplan for the development, for Buildings C and D now under construction, and for the 35 storey residential tower. This was the decision on which the St Helens Residents Association mounted a judicial review, but could not (quite) obtain a sufficiently favourable Counsel’s opinion on the prospects of success – needed for pre-event insurance to fund such a legal action. Under the English planning system, applicants can submit an application for a minor material amendment under Section 73 of the 1990 Town and Country Planning Act. There is no precise definition of ‘minor’. This is left for local planning authorities to decide. But there is Government guidance that says the changes should lead to ‘a development which is not substantially different from the one which has been approved’. We view the development now proposed by Imperial as ‘substantially different’. Our letter to the Council, objecting to the application can be seen here SHRA to LBHF on Imperial 3 April 2015.V2. This assesses the significance of the changes against a set of criteria used by Ealing Council. Hammersmith & Fulham has no equivalent. Comparing the proposed Michael Uren building with the original plans for a hotel, the changes are very significant.. The proposed use is wholly different. Imperial have been careful to keep the building at 13 storeys, and you have to read the documents accompanying the separate application for the Micael Uren building to learn that the floor to floor heights have increased with a resultant building 29.5m (100 feet) higher than that approved. The floorplans are entirely different, and the footprint 39% larger than the approved building. The ‘public square’ (one of the claimed ‘community benefits of the development) has shrunk significantly as a result and will receive even less sunlight. The density of development on the site, already higher than Canary Wharf, has increased still further. Wind tunnel effects, for pedestrians using the proposed underpass from Latimer Road to Wood Lane, will be severe. We do not believe that Imperial should be allowed to make these changes as a ‘minor material amendment’ to the 2012 approval. We believe that the Labour administration at the Council, which argued against the 2012 application, should require the whole masterplan to be looked at again. We are asking for support from Kensington and Chelsea Council, following their strong objections to the building heights in the 2012 proposals. We believe that the financing of the scheme should be scrutinised further, and the £35m grant from HEFCE and the £40 donation from Michael Uren taken into account in fresh negotiations on the S106 Agreement (see posts below). 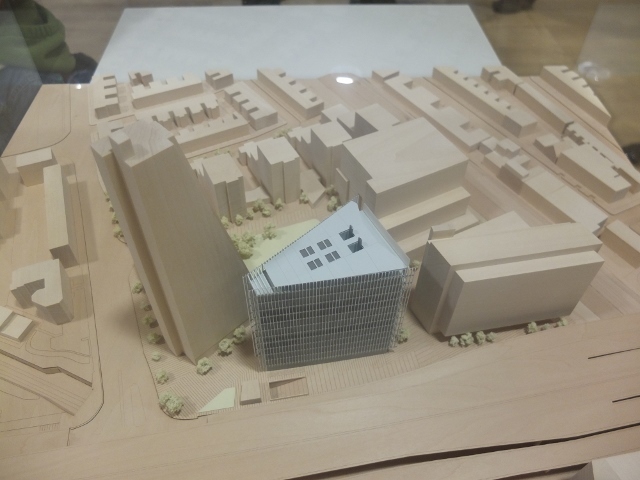 We believe the College should recognise that the proposed residential tower would be far better located on its additional landholding south of the Westway, closer to the Central Line, the new housing developments on the St James and Westfield sites, and where it would sit amongst other tall buildings rather than overshadowing two storey terraced housing. The details of this planning application can be found here, and that for the Michael Uren building here. The application for the minor material amendment tells one nothing of what has changed from the original approval – another reason why it should be refused. You have to look at the details for the Michael Uren building to appreciate what is changing. The deadline for comments is Monday 27th April.